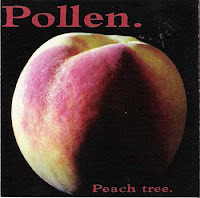 If you can get past the somewhat frivolous album cover, you just might find Pollen's third effort to be a veritable jewel (or more appropriately, 'peach'). Pop-core bands like Gameface and All are telltale inspirations for this departed Tempe, AZ crew, even if they aren't as quick-witted as either of them. Bittersweet, without pitching themselves into full-bore emo territory, and subtle but never blunting their rigorous intensity, Pollen strike a mature, melodic-laden balance that's near-addictive. Pollen's follow-up album, Chip, would be their last hurrah. Peach Tree was prefaced by Bluette in 1994, and Crescent in '95, both on the now extinct uber-indie label, Grass Records. always had a sweet spot for this one. the cover was so unassuming, it had originally escaped my radar when it came out. a friend of mine, who was more in tune to this sort of thing because of his job at a local college radio station, hipped me to this gem of melodic popcore. ever since, i've seen it many times in dollar bins far and wide. i'd love to see more stuff like this!! cheers. This is a nice Pop punk CD. I once worked with the guitar player in this band, kevin Scanlon. A very nice guy who has become a well known photographer. I love Pollen. I have Peach Tree and Chip. Their other albums are no longer in print, though. Do you have those albums? If so, could you please post them? ack! i really wanna get my hands on CHIP! anyone? I know this is a long shot, but does anyone have Crescent and/or the Co-Ed/Pollen split? Or anything else by Co-Ed, for that matter? Thanx! Any chance you can upload the split?